chikoeduardo wrote: In other news, I'm starting a new mod, an almost total conversion to something more Steampunk/Dieselpunk. 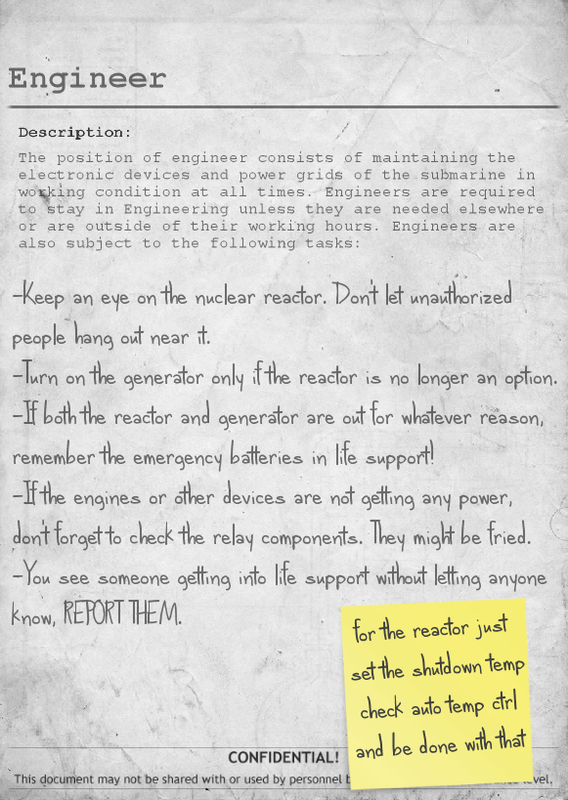 chikoeduardo wrote: A still unnamed replacement for the Nuclear Reactor. Really, this is real good news. Though everything runs on electricity in baro and I doubt theres any way of toning that down. Steam-Electric sounds about right. I'll add 2 options, this one and the Diesel-Electric one. It's still really early so suggestions are welcomed. I could also post the link to the mod so anyone can help me test stuff and for feedback. -In addition to wired alarms with different sounds so they fit the theme, I'm thinking about adding a "handheld" alarm in the for of a whistle. They will work like the Bike Horn but with a loop sounds so it will play a probably frantic whistle sound in loop when the player holds down the fire button. The Captain, Second-in-Command and Security will probably start with one in their inventory. -Handheld Radio instead of the Headset. This will work just like the headset, except that cannot be put in the mask slot, just carried in the inventory. -More firearms. Apart from the Revolver, a Rifle and a Machinegun. Conventional firearms will do more damage but they cannot be used underwater. The other type of firearm could be similar to the Gauss Weapons I did for the BTE mod. I could call them Clockwork Pistol/Rifle/Machinegun. -In addition to electric-powered wall lamps, I could also add ones that need to be manually feed with oil or diesel or something else. These alternate lamps will eventually run out of fuel and would need refueling but they are not affected by power-grid failure so they are another option for submarine creation. I have 3 days off starting from tomorrow so I'll spend most of my free time on implementing stuff for this mod and the BTE one. -Added a new roleplay item, Guitar. It plays a tune when the fire button is hold. It doesn't work underwater. -All husk creatures will never run away from stronger creatures now but they won't attack them either. -Mantises and Crawlers do area of effect structural damage depending on their size but deal less direct damage. Meaning they will do slightly bigger hull holes but will take a bit longer, especially when destroying doors. -Most creatures now have reduced impact tolerance, meaning they will get fall damage or hurt when hit with the submarine with enough speed. -Added the name of the mod in brackets to each of the names of the vessels so players can find the mod submarines easily. -All non-shuttle vessels have been provided with Charging Docks. They are installed in key locations for easy access. -Moved the Emergency Battery from Command to Life Support. The switches to turn their input and output on/off are still in Command under the Aux Power label. 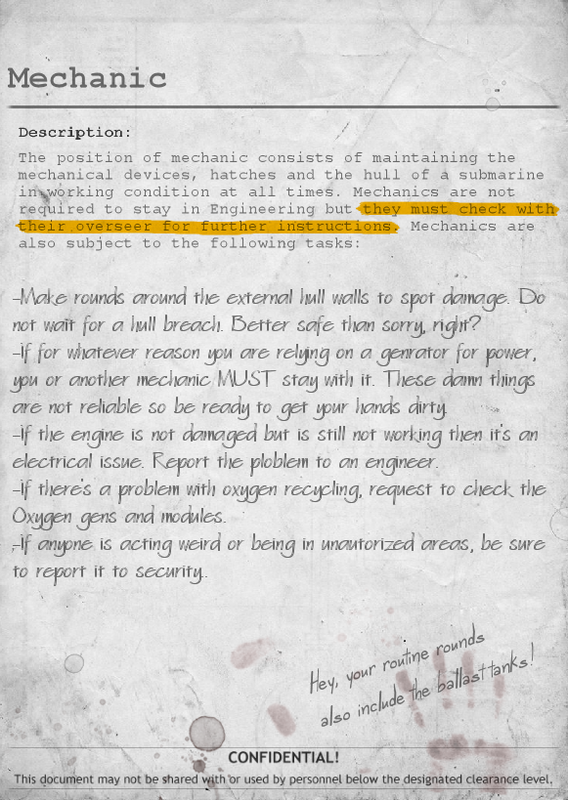 -Installed a Status Monitor in Life Support so the crew in Engineering have access to crucial information of the vessel. -Installed Emergency Batteries in Life Support. There are On/Off switches for them in both Life Support and Command. -Installed an Engine Control in Command. It allows the crew to turn both Engines on and off separately. -Installed a Ballast Control in Command. It allows the crew to turn the Ballast on and off and to open or close the door remotely. -Resized the Ballast Tanks so both of them are the same size. -Added a Guitar in one of the Private Quarters in the Cabins. Last edited by chikoeduardo on Fri Dec 29, 2017 3:11 pm, edited 1 time in total. Well, flintlock firearms will be the normal ones. Those are going to be pretty much Gauss Weapon reskins so they will work underwater, be semi/fully automatic and use a single item as ammo instead of rounds as separated ammo items so they are technologically advanced. They could be either that clockwork thing, or steam/pneumatic or they could be regular clip/magazine feed dieselpunk firearms. The Fabricator and Deconstructor might also be clockwork-themed related. -Doctors will have their own diving mask variants, they will look like a mix of a gas mask and a plague doctor mask. -Top hats as general crew vanity item. Doctors will probably spawn with one in their inventory. -Faction variants of military uniforms. There is a Coalition vs Renegade mission in the vanilla game that hints about an ongoing conflict so I could expand that with clothing. -Potato Sacks. In addition to being a container for potatoes, these will be wearable as masks/helmets for roleplaying purposes. Probably usable by interrogators, executioners, traitors, etc. I need feedback for the Guitar... The guitar can currently play one tune. I could make it play 27 different tunes but they will be randomly chosen. I tried making them play specific tunes when holding different items inside it and it works but will play the tune when you press the button instead of when you hold it and it can be heard anywhere on the map for some reason so that's a no-go. I also thought about adding an item similar to the sewing kits to turn them into guitars with a different tune each but that will require tons and tons of recipes so it's too cumbersome. 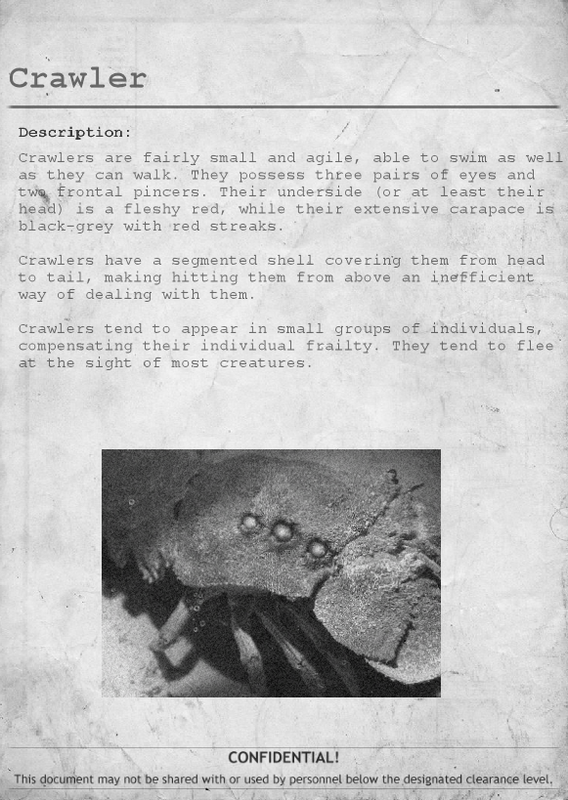 EDIT: So I've been playing SCP - Containment Breach again and I got an idea I could borrow from it. 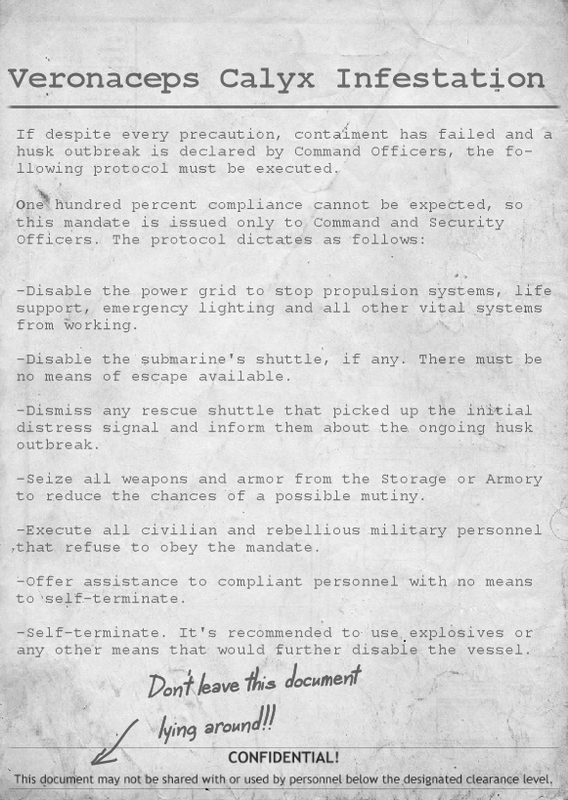 Lore/Instructions documents and Clipboards. 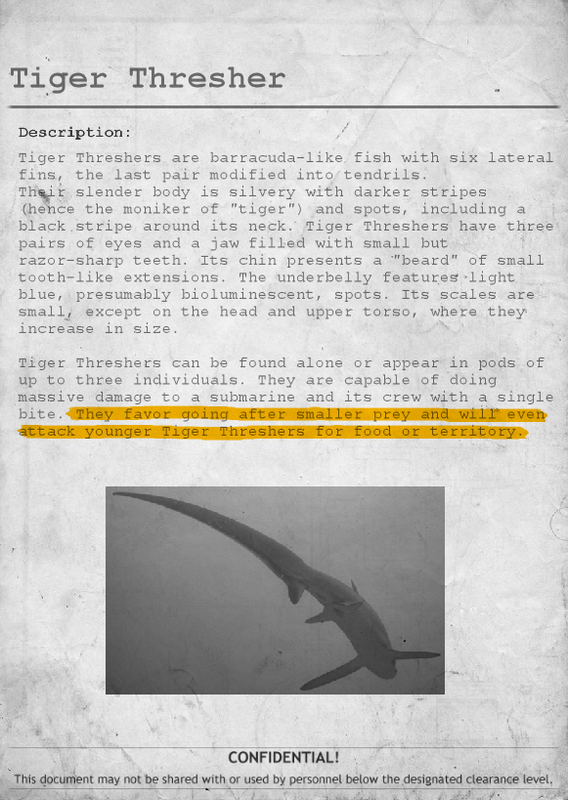 Documents could be about creatures, the Coalition vs Renegade conflict, game items and instructions about submarine systems or job/survival tips, etc. The clipboard could hold up to 10 or 20 documents so all of this could just use 1 inventory space. Clipboards could also be allowed to hold ID cards as a way to store extra ones or hide them. Hey, I've tried the guitar and I must say it was amazing. You can control the camera by moving the mouse more towards the player or further away to control shaking so you can change how intense the playing is. Other then that I tried it underwater stopped it from playing so that works I also tried it running out of air to see if it will loop of player dies, it also did not. In my opinion the guitar track is perfect something rudimentary but speaks a lot. I say add more instruments and we could get a band in game. ;) Maybe have a random track play so everytime you hold the button a different song will play. That's how it works when more tunes are added. It will play a different one every time you use it. Holding down the button will play the same tune in loop until you release the button but that's ok. Next update will probably include all 27 tunes for the guitar. There are 5 harmonica tunes so I'll probably add that instrument too. It's pretty basic but it's for testing purposes. I'll need to come up with a logo and other document related stuff so they look more legit. Anyways, they work like this. A soon as you put the document in either of your hands, the document is displayed as an image. This is MUCH better than what I originally wanted to do. As always, feedback is more than welcomed! So far Security Officers, Mechanics and Engineers spawn with a clipboard containing a job related document. 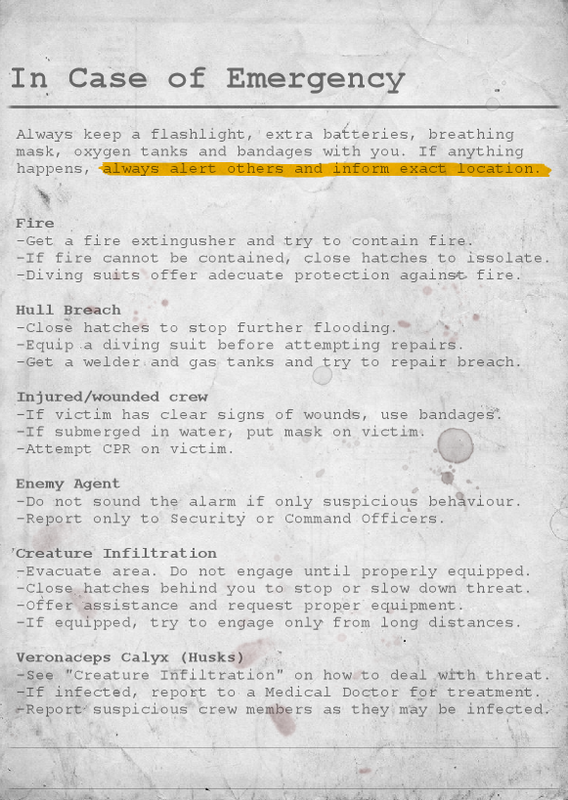 I'll make one for the rest of the jobs and I'll probably add some that will be shared among different jobs, like "in-case-of-emergency" docs about basic emergency instructions, like fire extinguishers and dealing with fire, basic first aid for injuries, dealing drowned crew members and the like. The clipboards have 10 slots so that's plenty of room for useful documents. I could maybe allow players to "craft" their own documents. Something like the Lone-Crewmember-Notes-Left-Behind trope. -Added a new roleplay item, Harmonica. It plays 5 different tunes when the fire button is hold. It doesn't work underwater. -Added 26 more tunes for the Guitar. They are randomly chosen each time the fire button is released and hold again. -Added a number of documents about various things like job descriptions, protocols, classified and misc ones. -Added a Clipboard. It can hold up to 10 documents or keycards. -Added a clown related item. It serves no purpose other than being a roleplaying item or to be recycled. -Changed the category of a number of items so they can be found in the proper tab in the store window. -Fixed the "Survivor Welding Helmet" being available in the store. -Removed the Diving Chest in the Armory. -Added a Harmonica somewhere in one of the rooms in the vessel. -Readded the clown outfit and related items. 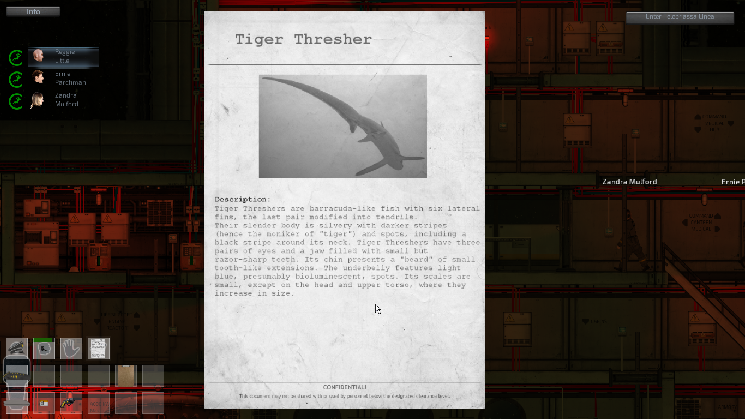 -Added a misc document lying around in one of the rooms. -Added a Diving Chest in the Airlock. -Added confidential documents somewhere in the vessel. The most noticeable addition for this update is documents. There are at least 21 different documents. To read them, just put them in one of your hands and Tah-Dah! The contents are shown right in front of the screen. You can throw them as a way to quickly react in case you are attacked, for instance. There's at least 1 piece of classified information that require 2 documents being held at the same time to be read. It's like a pretty basic "puzzle" document. I'll try to add more like it in the future. Clipboards are also a way to keep all of these documents, including keycards, in a single inventory slot. Keycards will always be displayed at the back of the clipboards, in the slot for them. 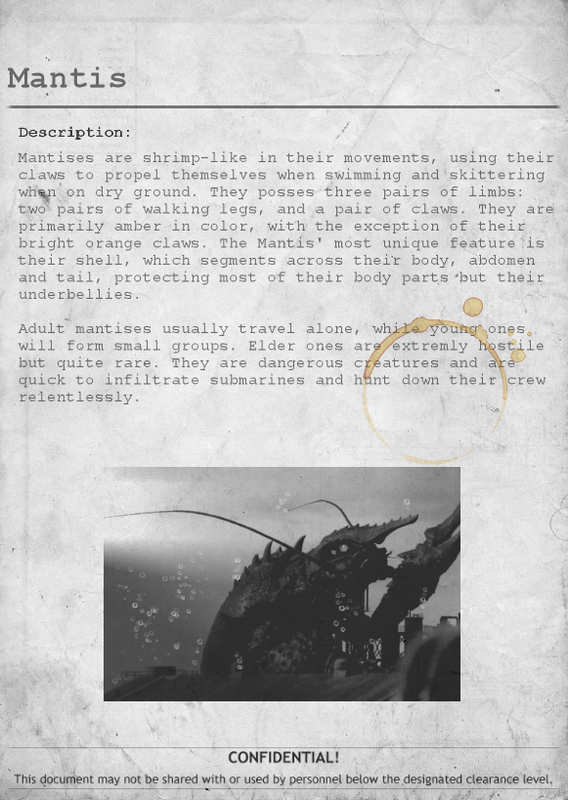 Then documents and misc pages will be displayed. Finally, the "Classified" cover, which will always be displayed first. 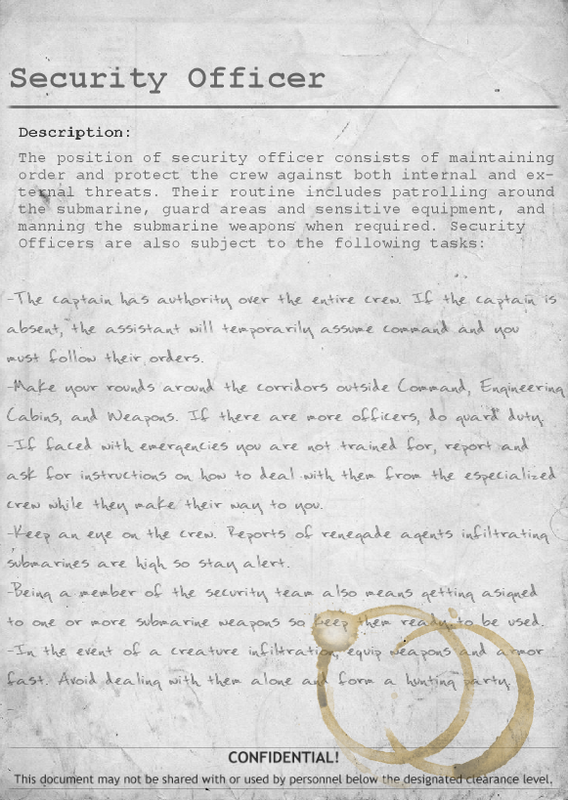 Clipboards, docs and keycards will be displayed behind most objects so players can hide them. Then again, thanks for this awesome mod!